As far as ski resorts go, there are not many better places in Europe to enjoy the apres-ski than Zermatt, with a choice of great cocktail bars and exclusive hotel bars, many offering live music. Shaped like a boat, this three story bar and restaurant underneath the Gornergrat rail bridge by the river in Zermatt town centre, is just a short walk from the Sunnegga Talstation, making it the apres-ski bar of choice for many. Premium spirits, fantastic cocktails and a sun deck make it popular all year around. The Zermatt Yacht Club restaurant downstairs is great for soaking up the booze too. This authentic Valais bar is hidden away in the heart of the old village amongst the famous wooden houses. Stuffed animals and portraits of old locals line the walls whilst the drinks are arguably the strongest in Zermatt with incredibly generous alcohol pourings. No visit here though is complete without trying the homemade speciality Eierlikör (egg liquor). No card payments. Driven by the ambition to be the first on the mountain early in the morning, in order to shoot photos of the sunrise and find white, untouched snow for snowboarding, Adrian Günter, built the first igloo village in Scuol, Graubünden, in 1995 before introducing the concept to Zermatt ten years later (and then to another seven destinations in Switzerland, Germany and Andorra since). Open from Christmas until it melts in April every year, the spectacular setting, 2700 metres high on the Rotenboden ski slope, offers an amazing view of the Matterhorn and the outside bar (open until 16:00) is the perfect place to grab a drink whilst taking a break from your ski, snowboard or snowshoe trek. A spectacular ice bar, carved into one of the igloos, offers an altogether different experience as does a restaurant where you can enjoy fondue. If you don't mind the cold temperature, you can stay overnight in an igloo of your own, watching the sunset over the Matterhorn from the jacuzzi. In January 2016, they also hope to break the World Record for the biggest igloo ever created. This warm and inviting traditional-style Alpine chalet bar was opened at Christmas 2014 along the river, on the edge of the Old Village, by Harry Lauber and his son Fabian, the owners of the adjacent Matterhorn Lodge hotel. Photos on the wall depict skiers from days gone by, whilst beautiful wood is complemented by thick sheep skin rugs. Located in the Hotel Firefly, this cool cocktail and gin bar is one of the best place to hangout in Zermatt. A 1957 Harley Davidson sits alongside a pool table, a cigar room, table football and a vintage 1965 pinball machine, whilst guests are served complimentary home dried meats and cheese as they sip on the great cocktails or 30 gins. One of the most popular bars in Zermatt, this 1920's style cocktail bar on the main street is owned by Dutchman "Gee" Veltink, the man behind Snowboat (above), and serves up live music every night. A great gin menu and some of the best drinks in town help make it one of the busiest bars in town. Downstairs, the Cuckoo Club nightclub and cigar room keeps the party going until 03:30. This typical ‘Valais’ style bar opposite the St. Mauritius church in the main town square, provides an enchanting backdrop for those special evenings in Zermatt. Built in 1879 and bought by Elsie Wicki in 1961, the bar has changed hands a few times since but has never lost its charm, continuing to offer one of the best whisky and wine collections in town, alongside a long cocktail list, Champagnes, oysters, caviar, snails and homemade foie gras. A cute little restaurant upstairs is one of Zermatt's best kept secrets. This smart restaurant and cocktail bar from famous Zermatt interior designer Heinz Julen can be found in his ancestor's former house, which dates back to 1818, and was given a new lease of life following the construction of the tunnel to the Omnia Hotel elevator, which opens up in its garden. One of the oldest buildings in Zermatt, it epitomises the village with its rough stone entranceway, a secluded garden, view of the Matterhorn and Julen's trademark twist on traditional Walser decor. 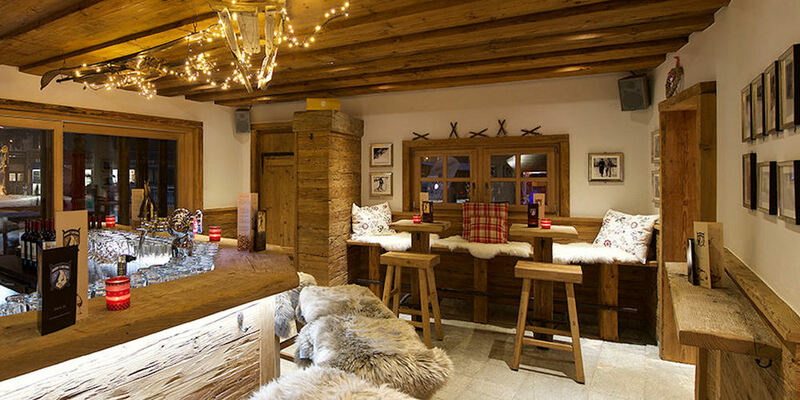 The old wood is contrasted with cowhide, leather, metal and sheepskin rugs, to produce the atmosphere of a traditional chalet, coupled with the appeal of contemporary design and some of the best drinks in town. Right at the end of the piste and next to the Sunnegga elevator entrance, this is the only ski-in ski-out bar within the village of Zermatt. A plush hotel terrace bar, it is the perfect choice for lively après-ski drinks with its large sun terrace overlooking the Matterhorn and rocking to the sounds of live music. You can escape the cold inside the lounge bar with its cosy fireplace. This Zermatt institution offers a host of entertainment choices. Whether it be creative drinks in the Cocktail Lounge, dancing the night away in the Club, watching a blockbuster movie in the Kino, dining in the posh After Seven restaurant or checking out the exhibitions in the Art Gallery, there is something here for everybody. Stamped all over with Heinz Julen's trademark interior design that shouts "Zermatt" more than any other, no visit to the village is complete without visiting here.